Come one, come all to Crafty Wonderland tomorrow (Sunday!) at the Doug Fir in Portland! This is the last regular monthly show of the year and the last regular monthly show at the Doug Fir period. It'll be a bittersweet day. Our pals Torie and Cathy have been running the monthly show for the past three and half years and they made the decision this month to transition into two larger shows per year. We are really excited about the move because it's going to be a for buyers and sellers alike. Still, we'll be a little sad doing this version of the show for the last time. 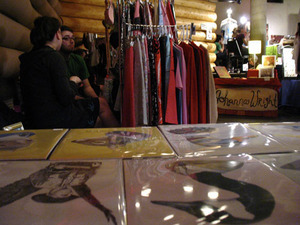 We were vendors at the very first Crafty Wonderland. In fact, that fateful day was our first craft show or real Berkley Illustration event ever (and it would be a year and a half after that when we finally joined Etsy). Back then each one of those little pieces was an original and they went for around $20/pop. 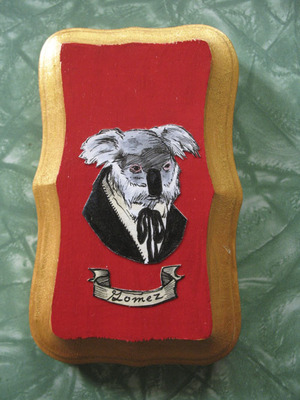 We decided before the show that each month we did Crafty Wonderland, we would produce items within a rotating theme. For this first month we chose the theme of ancestry and that decision was 80% of the genesis of the Berkley animal portrait. We never did end up doing another theme month. So many things have changed since then. Perhaps most notably, we now have better cameras. Ouch, looking at that photo above is painful. I say that it's time to bring back the bow-tied ventriloquist Chameleon! And what of poor Marcel? There is a very lucky person out there in the world who owns this little slice of history. 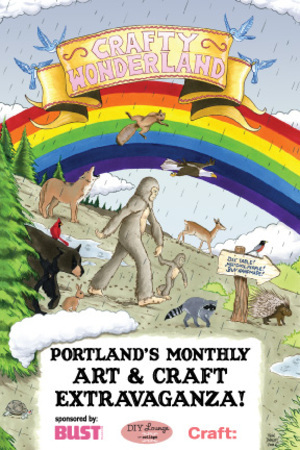 If you are in Portland, we hope to see you tomorrow at the show! If you're lucky, we won't have slept and our faces will still be painted. If we're lucky, our faces will be clean. I was eager to report on last weekend's viewing of the Handmade Nation Portland premiere, but our lovely burg has been hit with a sudden dose of springtime and typing indoors just didn't seem like a reasonable chore. After a couple days of acclimating to the sun again, however, I'm ready to share. If you are lucky enough to live a town with a screening of Handmade Nation, you need to go! Faythe Levine's labor of love is not only chock full of interesting and relevant talent (including some friends!) but it's also a well made film with a great soundtrack. I dare you to not be inspired to make something after watching it. Double dare you, even. Faythe mentioned in her Q&A that she was shooting for getting the film onto DVD in the next couple month so keep an eye out. I'll keep you posted if I hear anything. I should also mention that at the Friday premiere (the one we attended) viewers received some pretty insane swag bags full of an almost unreasonable amount of goodness. We scored stuff from a bunch of our favorites including Susan Beal, Bossanova Baby, Crafty Wonderland, Something's Hiding In Here, Strawberry Luna, Kate Bingaman-Burt, Suddenly It's Real, Pinball Publishing, Lisa Congdon, The Grass Hut, Nikki McClure, Shannon Rankin and on and on... Is this how celebrities feel when they get free gold plated foot cream tubes at the Oscars? Elsewhere in the weekend, my husband went on a day trip to the Emerald City Comicon and all he brought me was this blurry photo of a nuclear Bat family. Anyway, back to the weekend of handmade festivities, I got to help Cathy and Torie fill some eggs for the new Crafty Wonderland gumball machine (craftball machine?) which was fun and proved super popular at the next day's third birthday celebration for the ol' Wonderland. Four notes: 1. Cilantro is really hard to draw. I was proud of myself for getting it done without Ryan's assistance. 2. Homemade lemonade is better. 3. I love having outdoor time with friends again. 4. While typing this post I had to look up how to spell "Jamiroquai". I'm not going to tell you why. Sunday was much more of an indoor day than Saturday which worked out well considering that Portland started to do that crazy ol' rain thing it's known for. We spent much of the day at Crafty Wonderland in our corner bunker. It was the second anniversary of the event and I can't believe time has gone so fast (cliche, I know). 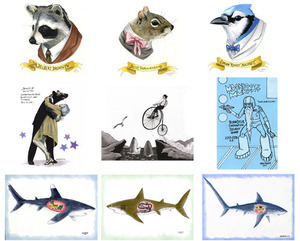 We sold at the very first sale and really that was the first time Ryan started doing the animal portraits. 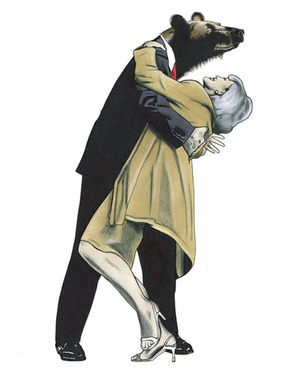 So, happy two year anniversary to you, animals! 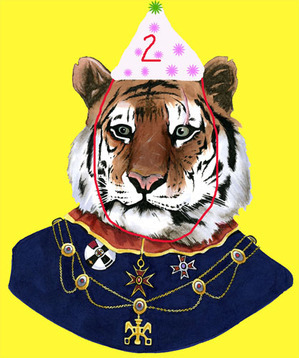 ...and here is the first animal portrait Ryan drew. He's come a long way, no? Somehow we had enough steam to make it out to the Cat Power show later that evening as well. My camera batteries died right when she took the stage but here is a pic of her opening act, Appaloosa. We were a little confused when we walked in and saw this pretty lady in a sparkly green tube dress was singing alone with an electronic box. We thought perhaps we had stumbled into Open Mic night by mistake. As she went on, however, we really got into her and even bought her CD. She mentioned later in the set that the other member of the band was held up in London (presumably this was the person who usually controls the electronic boxes) so we have to give her serious props for going it alone. She kind of reminds me of Nico from the Velvet Underground mixed in with a little Stereolab. Cat Power was grand, of course. Very intense. 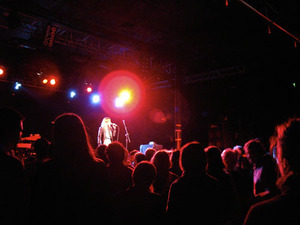 But concert going citizens of Portland - why must you talk so loud during quiet songs? Why????? Now that the weekend is over, onto the Etsy business at hand! Here is the sneak preview of the originals we'll be listing on Ryan's Etsy site tomorrow evening. Please enjoy! It's been a pretty busy and exciting year for me art-wise so far to say the least. I feel like I've already produced a ton of pieces in the last few months and I have lots and lots of upcoming projects, shows, sales, and other artistic obligations that I'm predicting will have me busy for practically the rest of the year. I'm not complaining though- this is a great thing for me to be experiencing and I'm so grateful. Right now I'm up to my ears creating new artwork for the Annual Buckman Art Show this Friday & Saturday. The show is an annual benefit for an arts magnet elementary school in Portland and some of the coolest kids I know go there. For some reason we've never been able to attend in past years so I'm really looking forward to seeing the slew of art that will be on display. We are hoping to bring some home for ourselves too. I'm having a blast churning out pieces in yet another tight-deadline situation-something I finally feel I'm getting used to. 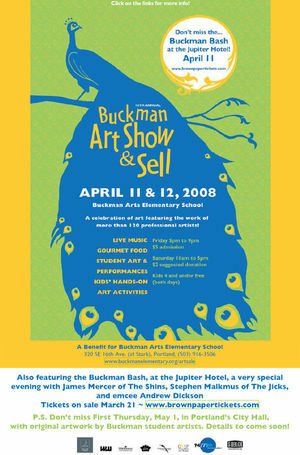 Portions of the sales are going to the Buckman School, which is always a good thing - Buckman seems like a pretty awesome school. Then, on Sunday. 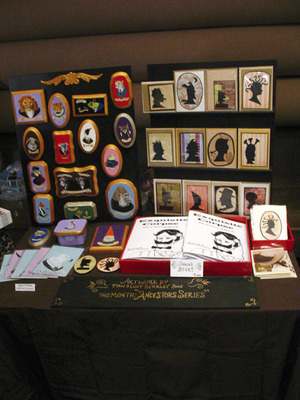 Lucy and I will be selling at Crafty Wonderland which, I might add, is celebrating it's 2nd anniversary. If you're gonna be in Portland this weekend, I hope to see you at either of the events. We'll probably put the originals that don't sell up on Etsy so look out for that. ...And now back to the drawing board. Literally.